Bowcock bowl, Bow Porcelain Factory, 1759, British Museum. 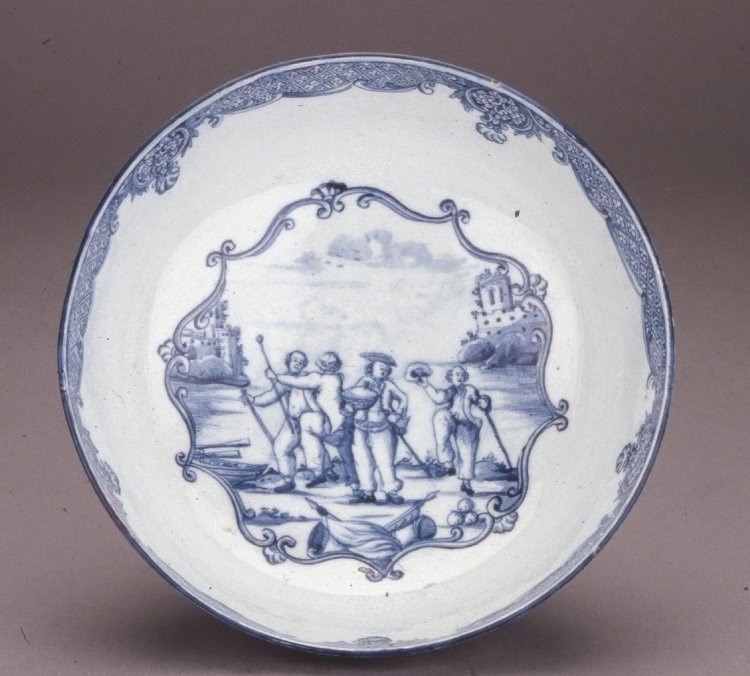 Chinese porcelain was widely popular in the eighteenth century, both in America and Britain. This trend inspired mimicry of Chinese styles. The Bow Porcelain Factory represented one such effort. Established in the appropriately named New Canton, the factory churned out a wide variety of ceramics that can be found in collections around the world: the Victoria and Albert Museum, Art Institute of Chicago, and, of course, the British Museum. This punch bowl is decorated on its interior surface with a small mess of sailors enjoying themselves around a bowl of punch. Each carries a walking stick, just all of them wear short jackets and trousers. None of them wear waistcoats. The fellow at the center, supporting the bowl in his right hand, wears a cocked hat, though it is difficult to tell precisely how it is cocked. To the right of him dances an overly excited tar, who waves his round hat in one hand.